While at 10 Corso Como ~ i really wish i had a pack of color pencils to take to the walls of Maison Martin Margiela’s pop up shoppable installation space that is covered in black and white color by number surfaces! 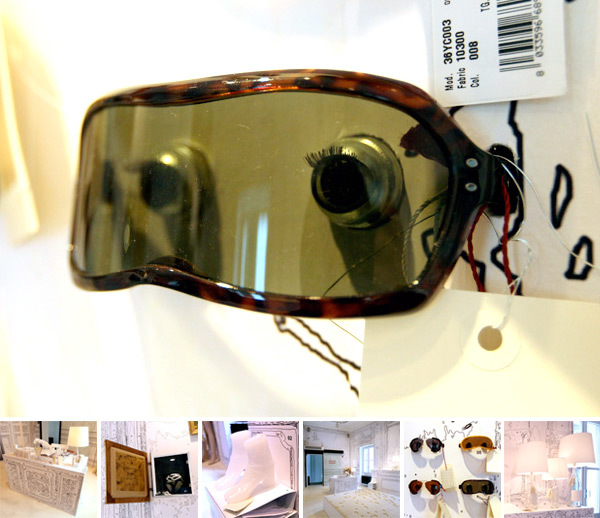 All non-fashion lines of the Maison are displayed: home objects (line 13), fragrances (line 3), sunglasses (line 8) and jewellery pieces (line 12). Also memorable ~ the jewelry are all in safes behind paintings… which are all open! And of course, the creepy dolls eyes behind each pair of sunglasses… see lots of pics of the single room on the next page! While exploring Ventura Lambrate during the Milan Salone 2010 ~ in the dreary weather, we stumble into a run down garage looking space… and get pointed to enter a dark curtain across the lot… like sheep, we follow. It’s DARK in there! But then, quickly i get distracted by these shiny objects… radiators… that remind me of 50’s cars… seriously, its something about those metallic paint jobs with the chrome… it just draws you right in! 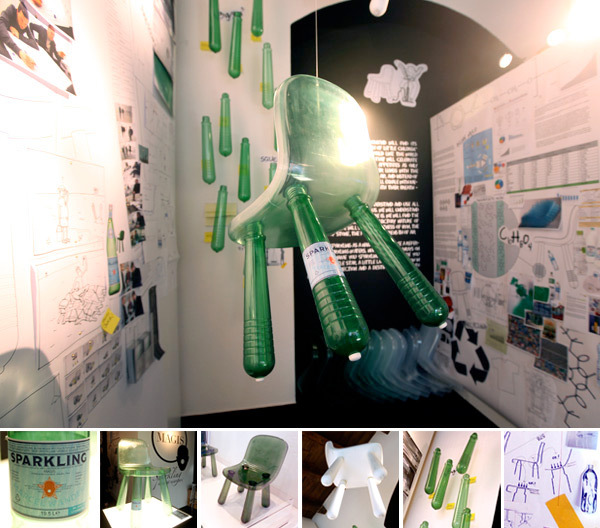 These were part of Autofficina (a Dutch Still Life Composition), an assembly of products shown during Salone in the Lambrate area featuring the works of a group of prominent Dutch designers. 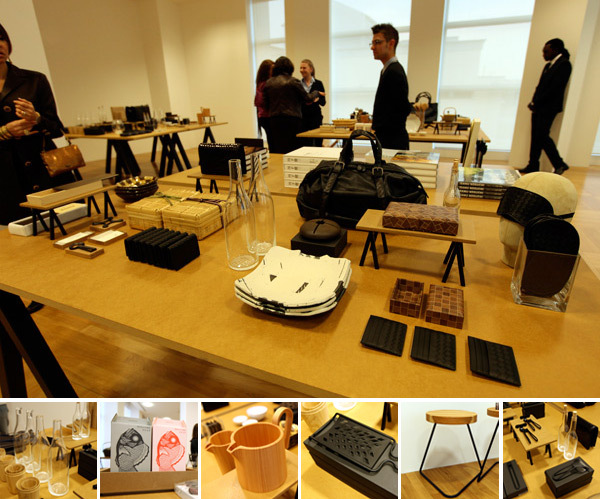 The exhibitors were looking for international producers, retailers or galleries. All items are either in production or ready to be produced. 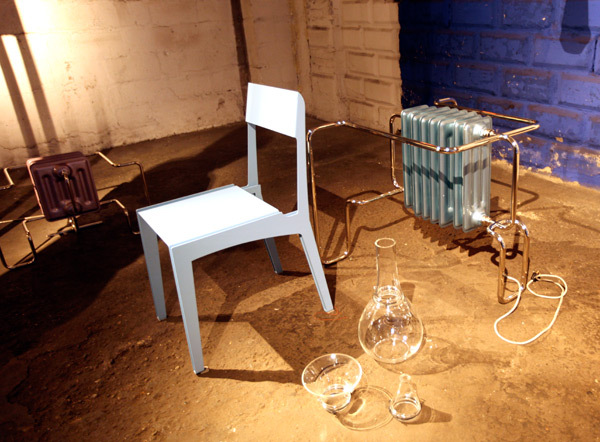 The space heaters are part of the series, “I am furniture”, designed by dutch design Studio Vraay. See more info, and lots more pics of the radiators as well as the Autofficina exhibition on the next page! Hope. After a night of endless events, too many people, and walking all over the city… i must admit walking into a room of HOPE lamps really did make me light up… i was just giddy at the sight of them all together! And then i had to go directly under one to see how it looked from below… Luce Plan’s light designed by Francisco Gomez Paz and Paolo RIzzato, and winner of the 2010 red dot design award, Hope was born in 2009 as a modern reinterpretation of classic chandeliers. The design is a combination of a steel structure with polycarbonate arms and plastic Fresnel lenses to create a refraction effect equivalent to that of glass. There is something so versatile and enamoring about this lamp, in person they just draw you right in… fun to see the way the family has grown and evolved from the original modular design. This year Luceplan proposed four new versions capable of satisfying a variety of demands.The large suspension lamp with 105 pairs of illuminating lenses can be enlarged upon request for special projects. 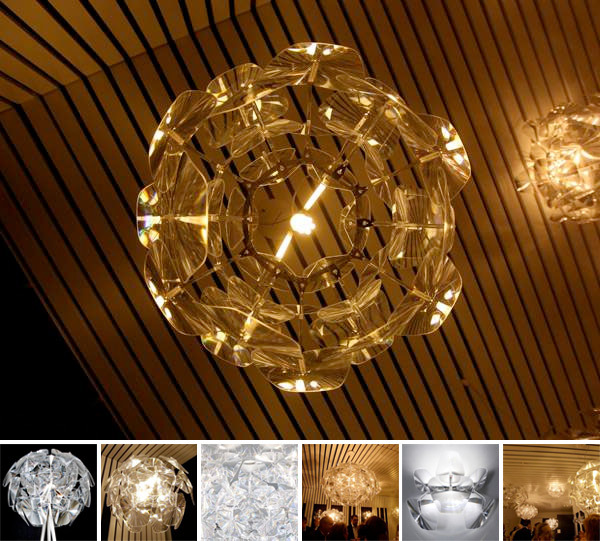 This is the perfect solution for public spaces where a sparkling and joyful effect is desired. The wall model is smaller, with three pairs of lenses, while the ceiling model has 12 pairs of lenses. Finally, the floor version completes the Hope family: polished stainless steel tripod supports 18 pairs of illuminating lenses. See more pictures from the Luce Plan event as well as all the new Hope family on the next page! p.s. also walking past the dark lobby of a beautiful old milanese office building, i stopped dead in my tracks when i saw a large hope pendant in the center… it looked stunning! 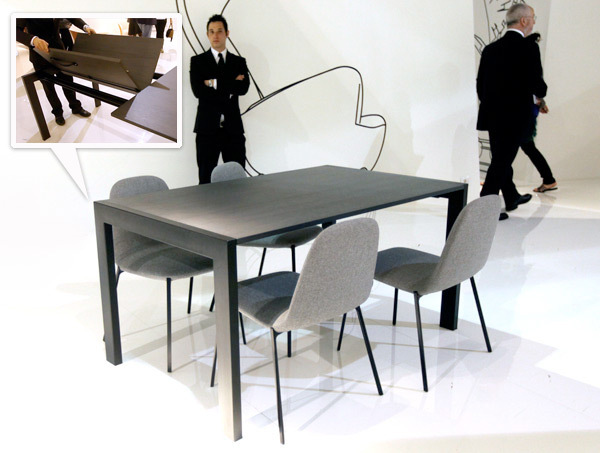 Zanotta Zum Expansion Table by Emaf Progetti… Sure it looks like a sleek simple table, but you have to see HOW it expands! We made the guy open it again just so i could make a video to show you ~ because you really need to see it in action to appreciate how awesome it is! See close ups and video on the next page! 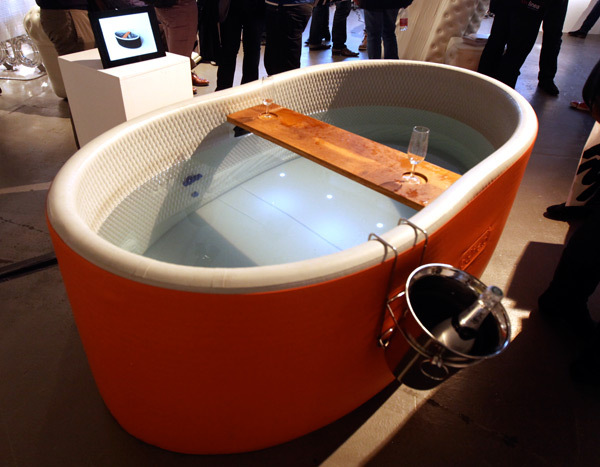 Blofield is known for its inflatable chesterfield arm chairs and sofas… spotted at Superstudio Piu ~ an inflatable BATHTUB! And it was incredibly sturdy! Complete with champagne bucket and wood rack for wine glasses, naturally. Can’t find images of it online at the moment, but you can see my few detail shots on the next page! 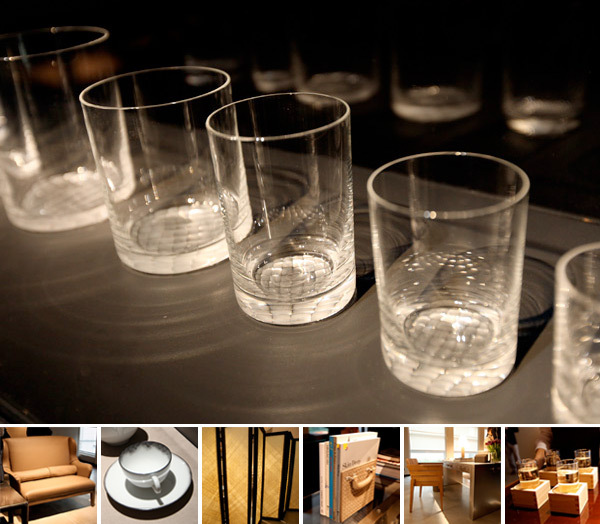 On standouts at the Fiera this year ~ the green and wood combination pulled me right in. 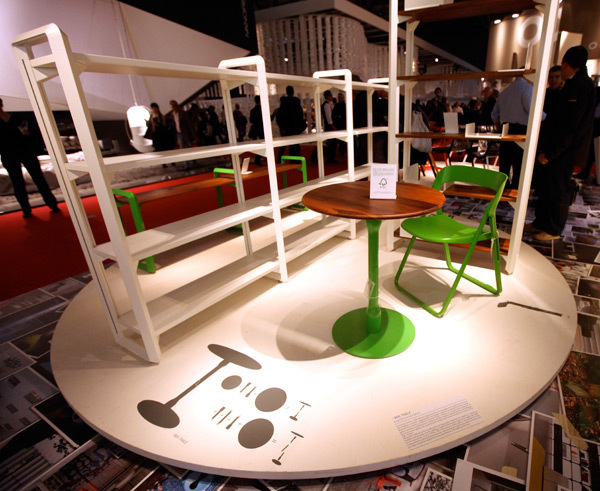 Designed by Giulio Iacchetti for CASAMANIA, the BEK is a small but eye catching table. It looks like an excellent option to live underneath my Droog parasol. The main feature of this table is concentrated it is leg, composed of two identical metal elements: the combination of these two halves creates a unique object, perfectly adapted to be mounted between the table and its base. The series, including the BEK chair, were designed in 2009 but now for 2010 they are available in this new shade of green that looks super nice combined with natural wood. Additionally the matching BLOOM bookshelf is adorable as well! See images and more info of both on the next page! On adorable irresistible impulse buys ~ i’m totally carrying this Ele Funnel back in my luggage. 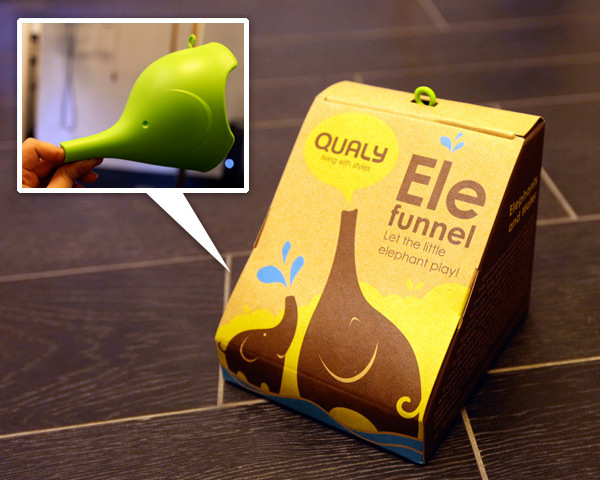 Thai Qualy Design, had the most adorable (and adorably packaged) Ele Funnel! The graphics are great, the plastic feels so nice in your hand… you can even hang it on the wall… see lots of pics unboxing it on the next page! While rushing to a Molteni/Ferragamo event on Montenapoleone the other night (which was definitely a fire hazard with the number of people crammed in the store!) 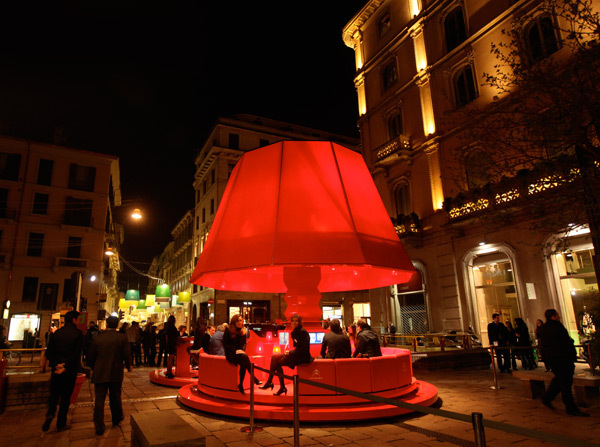 ~ i was pleasantly surprised and amused by the Citroën DS3 Design Driver ~ a huge red lamp serving as a lounge as you popped out at the Montenapoleone metro. A lamp that sized ~ wow ~ you just can’t help but smile when you see it! See more images of the stunning lamp on the next page! Perhaps one of our favorite finds while running around Ventura Lambrate ~ the amazing AXECHAIR! 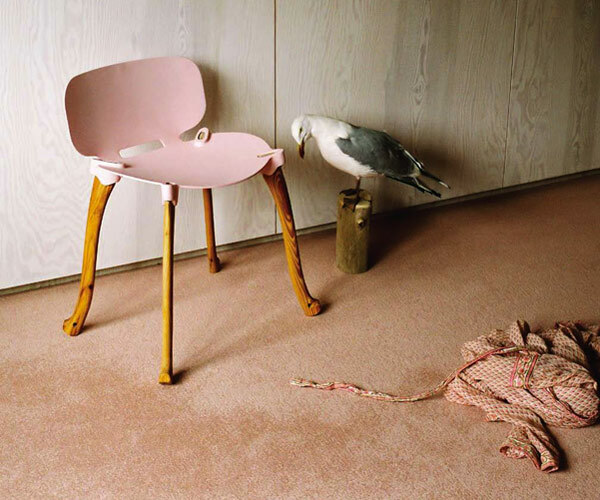 As part of the Made In Arnhem (Netherlands) exhibition Weltevree presented their beautiful AXECHAIR designed by Floris Schoonderbeek (whose Dutchtub, we loved and lusted after for some time now!) The AXECHAIR is a chair made of wood and cast aluminum, with a surprising use of existing axe handles by Swedish company Gränsfors, Gränsfors Bruks has manufactured axes and hatchets in Sweden since 1902. The unambiguous and powerful joints are directly derived from the way axes are made. Floris Schoonderbeek on the Axechair: “Gränsfors is an inspirational company in terms of both its technology and its culture. The Axechair is actually a statement of identity - a statement about Gränsfors, the company and the village. And this has produced a practical chair, sturdy yet elegant. On random ideas ~ i secretly wish they would do a version of this with the American Axes - Best Made Co! Can you just imagine how fun the incredible boxes would be? And the fun colored handles? Ahhh, a girl can dream! But firstly, check out the amazing pics (both from the booth, as well as making of pics!) on the next page of the AXECHAIR! 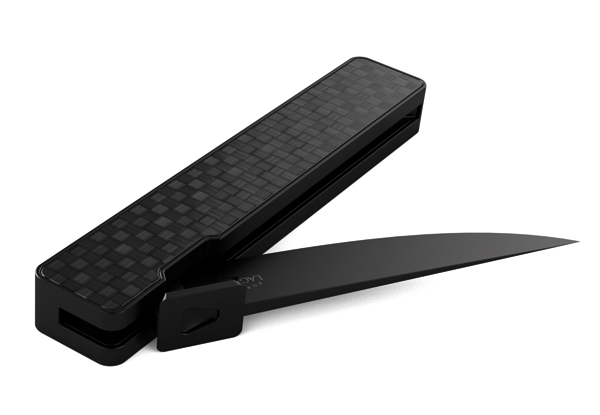 One of the objects that caught our attention at the Ora-Ito showroom in zona Tortona was the cool looking Furtivo (very appropriate) knife, designed for french knife makers, Forge de Laguiole, with its all black metal minimalist styling and carbon fiber inlays makes it a very desirable pocket friendly accessory. See more pics of it on the next page! 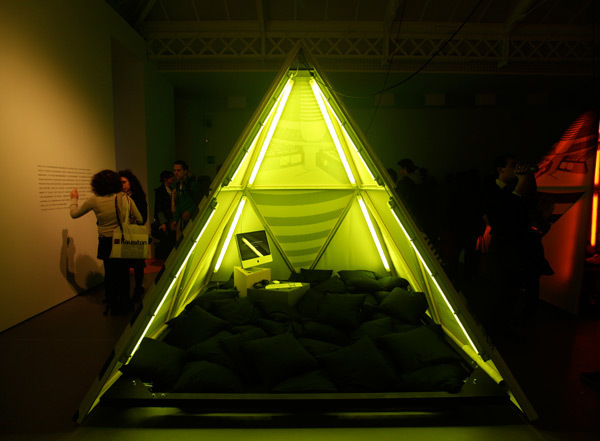 Post apocalyptic techno camps with an 80’s florescent pyramid teepee flair - filled with pillows and and imacs and kids hanging out… this was the scene at Nike’s new art space, Nike Stadium ~ current set up designed by the collective, Super (Thomas Ruff, Richard Previdi, and Massimiliano Buvoli)! I love the way the sections of the pyramids are single florescent bulb lengths… The three pyramids are Green, Yellow, and Red ~ the colors of the subway lines ~ and the graphics are of San Siro Stadium. Additionally the event for the space had live painting ~ and a look at the making of the Mercurial Vapor Superfly II ~ including looks at Ronaldo’s foot molds… I’m excited to see what else will pop up in some of the beautiful gallery/event spaces in the Nike building, it promises to involve more engaging community focused arts and events! Take a peek at pics of the installation on the next page! Spotted at Milan Salone Satellite 2010 ~ Fresh From The Mint ~ Six graduates from Academy of Art and Design Offenbach, Germany showcased their unconventional and diverse approaches. 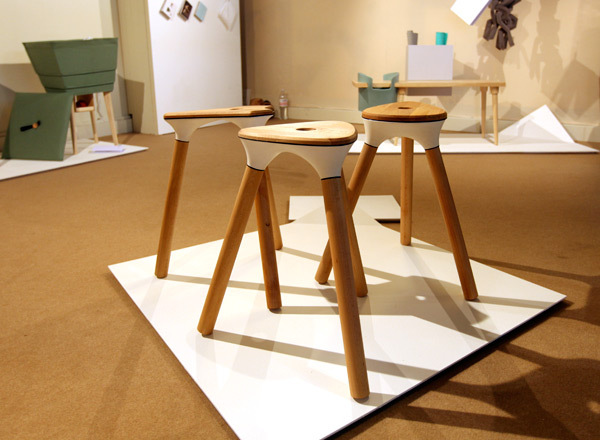 Loved the material combination designer Nico Reinhardt for his Stooltypes_01-04! Take a peek at closeups on the next page! It’s also fascinating to see how they are put together!